Work with a Top Real Estate Agent in Your Market & get Paid 15% of the Total Gross Real Estate Commission as a "Rebate" at Closing saving you Thousands. Work with the Best Agents in Your Market. Get Back 15% of the Total Gross Commission. Any type of Real Estate Residential or Commercial. Our service to you is absolutely Free! The U.S. Dept. 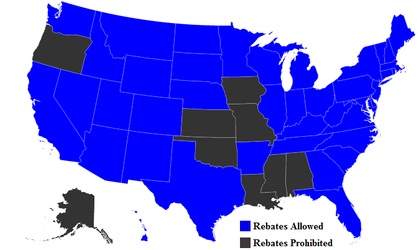 of Justice legally allows Real Estate Commission Rebates in the below states. We are the leading real estate referral company in the United States. We will match you with a top real estate agent in your market to assist in your purchase or sale who will rebate you back 15% of the total gross real estate commission saving you thousands on average. See how it works here.